The two letters GT, mean so much to anyone who loves cars. Grand Tourer, a title designated to cars that are 2 plus 2 coupes capable of providing high performance, comfort and luggage space for driver, and three passengers. Toyota has a long history of producing great GTs, one an icon amongst motoring enthusiasts. The 2000GT manufactured in the 1960s, was even featured in You Only Live Twice, classic James Bond film. The latest GT86 continues the history of the 2000GT, as it did when first launched in 2012. Sharing a front mounted boxer engine configuration, with rear wheel drive. This provides great centre of balance and the preferred set up for any sports car lover. Look at the great lines of the 1960s car and see the similarity in the latest GT86. The 2 litre, 4 cyclinder Boxer engine has 16 valves and is a double over head cam. This means it is very smooth for a four cyclinder car and produces a great deal of power for it’s size. Top speed of 140 MPH would be easily reached if UK roads allowed, I was restricted to the legal limit. 0-62 MPH is a quick 7.2 secs. For an excellent sportscar the car returns good fuel economy with 44.1 MPG on extra urban. Great for those long European road trips to sunny climates. Speaking of road trips the GT86 easily accommodates all types of loads, from those designer suitcases, film and photographic kit, to Asda weekly shopping. The large boot is very practical and supports the car being a true Grand Tourer. Toyota have kept the GT86 a manual and the gearbox is excellent allowing rapid changes when required. It is a six speed which I found is sufficient in most driving situations, but slightly lacking when pushing speeds over 70. The car always seems to want to go even at this speed and if you were to take this abroad where higher speed limits are allowed, an extra gear would be beneficial. A real driver’s cockpit, with everything you need easily to hand. Toyota have not gone down the paddle shift route with this model, and I love that. Proper gearstick, and your left hand fully used. A great view inside and out. You just seem to fit in perfectly. The seat envelops you, and everything is in the right place, to allow you to just press, or switch controls. Driving position is low, as is the car, but vision is not sacrificed. You can see all round with ease. Design flows through the years, with the driver being paramount. 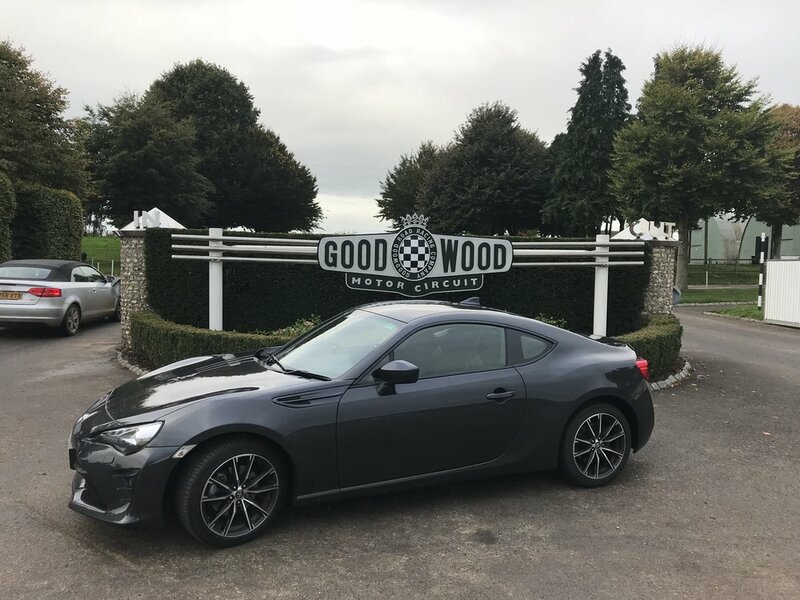 Toyota have always looked to racing in improving their road cars and this is clearly seen and felt when driving the GT86. The ride is quite harsh as it is set up for handling and not comfort. Bumps are driven over rather than cushioned, but ride height is good so bodywork is not hit if the odd sleeping policeman is taken a bit too quickly. As mentioned the suspension is set up to deliver great road handling, and it does this in spades. Corners can be taken comfortably at speed and without any deviation from your line. You feel everything back through the steeringwheel and accelerator and the car responds to your inputs willingly. It’s a car that likes to go fast, so it could grace any race track and keep the driver very entertained. It has a button for track driving, sadly this is disconnected on Press cars, so I did not have the opportunity to explore what it allows. You can also turn off traction control to have more fun with the awesome power put out by this excellent Coupe. Traction control ( Vehicle Stability Control), engaged it is very difficult to get the rearend out of shape as grip and handling are so good, but with it off you can put the power on and get it sideways. I am assuming this with a fair amount of inside knowledge, as again the press car has traction control permanently set. See my film review on Youtube next weekMrJezwebb, where you can see the excellent handling and performance. The current GT86 comes with a long list of features for your comfort, safety and entertainment. Too many to list here and keep you entertained. Go on Toyota’s excellent website for full details of the car’s features. As with all Toyotas, you know they are rock solid and reliable, backing this up the company provides a 5 year warranty and servicing is annually or 10k miles. On the road price is £26,855 which is great value for a car you can use every day of the week to complete those mundane tasks, then hit the B roads or track at the weekend and have a great deal of fun. If you buy one, pop round and take me out. Photos, taken by Jeremy Webb courtesy of Toyota UK. wordpress behind the shoot blog. The Vanquish S from Aston Martin.IN "AGENCY"